The old and forgotten Expressway project appears to have received a shot in the arm with the Central Govt proposing to taking up the challenge. The report last month in Keralakaumudi talks about a fresh alignment from Kanyakumari to Trichur, passing via Trivandrum- Punalur- Kottayam and eastern parts of Cochin city and terminating at Trichur. The project makes up Phase I of the project, and the State Govt has requested the Expressway to be extended to Mangalore through the Malabar regions. The only flipside is that we won't have the 'International' tag to this project, unlike the other similar breeds propping up all over the small state, like the Int'l Airports proposed in almost all Municipalities. Now the real challenge is only set to begin here. The report says that Central Govt will fund the acquisition of land, but still it's tricky...the onus of the process of acquisition falls back on Kerala Govt. I've told all I've to say about the Kerala Expressway project here in this post: Setting the Standards: Part II, and I just wanna add on to that post. 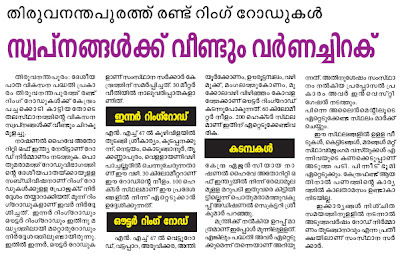 The Central Govt has also planned a few new highways in Trivandrum, except from the Expressway project. Here is a snapshot. In a surprisingly far-sighted and appreciative move, GoI has envisaged development of a few new roads to augment the development of the Kerala capital. Two ring roads, both 30m wide, 4 laned highways connecting the suburbs of the city have been proposed. 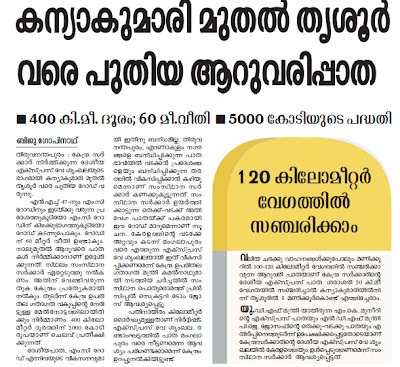 An outer ring road, 60 km long will connect Vizhinjam and Kovalam to the MC Road in Vattapara (via Aruvikkara) and from there connecting to NH 47 via the Film & Video Park. The 30km long inner ring road will connect the immediate peripheries of the urban district from Thiruvallam all the way around to Kuzhivila near Technopark Phase III. Apart from this, a stand-alone bypass road is also proposed from Attingal to Parassala, which will re-route all the bypassing traffic without touching urban Trivandrum. 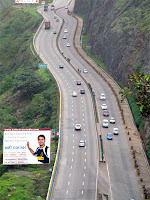 It remains to be seen if both the projects, the Expressway and stand-alone Bypass are going to be materialized. Two tolled super highways vying for the same traffic may not be a great idea but I'd like to see the Expressway materialize here. Instead of the stand-alone Bypass, the ring road projects could do much more benefits to the city. Once the Technocity, Technopark Expansion and various Industrial Parks proposed along the NH 47 are realized then it will become essential for re-routing the traffic or else we will step out of our houses into a 40km long traffic snarl. Here is the rough sketch of the proposed road projects: The blue one indicates the stand-alone bypass and the red marks the route of the inner and outer ring roads. The proposed Expressway may well pass just inside the blue line and to the right of the MC Road. There were also talks about connecting Trivandrum to the neighbouring town of Tirunelveli via the Ghats but given the nature and classification of the terrain that is likely to remain in paper. Too many environmental constraints, and who would like to waste their time and energy (and money) on that? Talking about waste of money and time, here is a classical whacky one. Kerala Govt is going to undertake a feasibility study to connect Kesavadasapuram to East Fort through a 6km long flyover, and that too without ramps in between! The lightening quick mental calculations by Hon Minister PJ Joseph estimates the cost to be at around 500 crores. 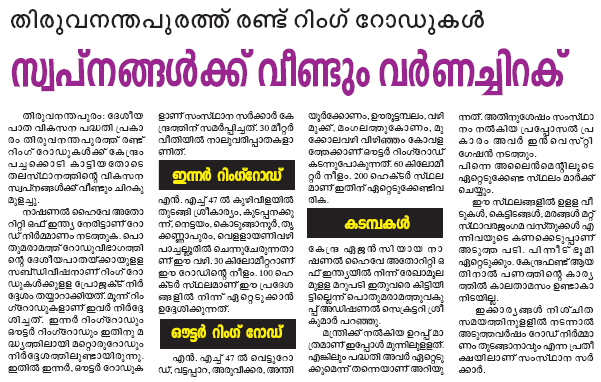 huh, the whole massive Trivandrum Road Development project cost just over 250 crores, how many times effective and beneficial it would be for the city if that money is used for implementing a Phase II of road developments? You could build over 20 flyovers in the city with that money. Hmm, the only party which benefits from these dream-projects would be the consultants. It is about time that our leaders and population see the wider picture that good roads are always the course to progress, instead of building Airports all over the state. Agree, airports are far glamorous than building a black asphalted road surface, but which one reaps dividends?